Blindfold Card Reading: You’ll learn an underground card cheating technique that allows you to identify selected cards from a truly shuffled deck, while legitimately blindfolded. Bank Night Revisited: Harlan’s updated spin on the perennial favorite, Bank Night, where everybody wins big money, but you always get to keep the top prize. Dr. Bridges’ Thought Projection: A word is randomly chosen, and you reveal your prediction is the page number where it appears in the dictionary. Plus, the word is circled! The Chess Knights Tour: Blindfolded with your head turned away, you’re able to call out every move your helper needs to make for a perfect knight’s tour of the chessboard. 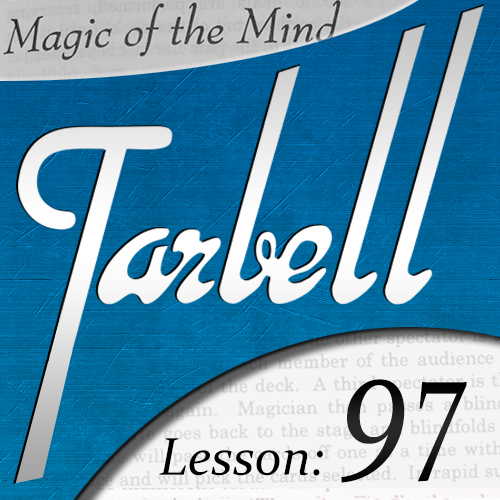 The Tarbell Rapid Memory Act: You’ll learn to demonstrate your super-memory skills by instantly recalling twenty random items in any order, forwards or backwards.